Like many of the apps and services that are popular in today’s society, the Spotify music streaming service lets you add friends. This enables a lot of sharing functions, while also allowing you to see what those friends are listening to. 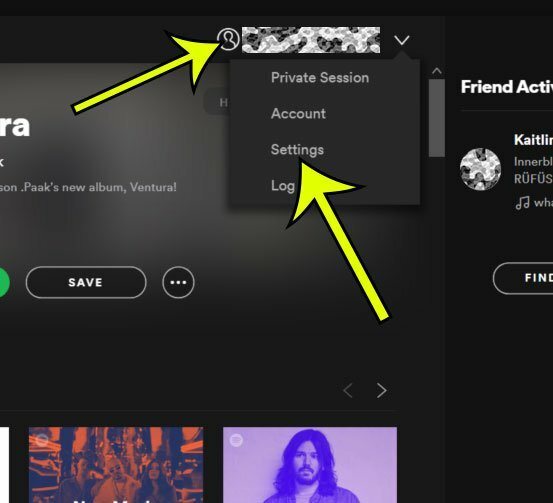 If you are using Spotify on your desktop computer, then this friend activity is displayed in a column at the right side of the window. This makes that activity easy to see, and clicking on anything in a friend’s activity can make it easy for you to listen to the same music. 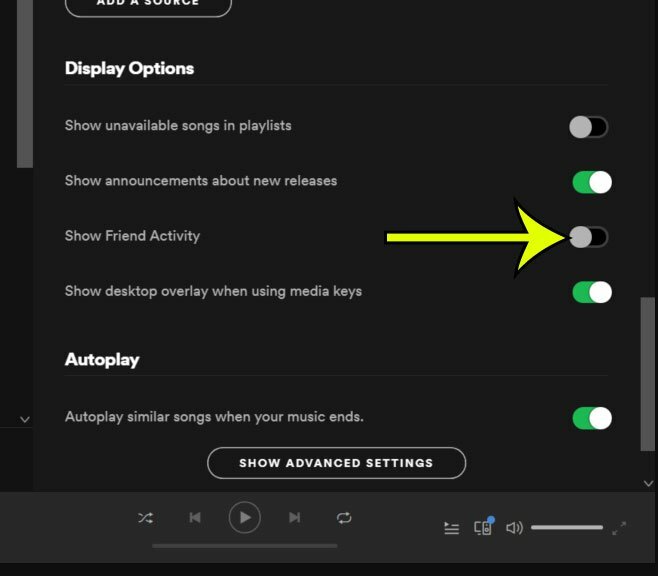 But if you find that you aren’t using this feature and would like to simplify the Spotify display a bit, then you can follow the steps below to hide this friend activity. The steps in this article were performed in the Spotify app for Windows 10. Note that this isn’t going to remove any of your friends, or prevent you from using that feature. It simply hides the Friend Activity section of the app. Step 2: Click your name at the top of the window, then select the Settings option. Step 3: Scroll down to the Display Options section of the menu, then click the button to the right of Show Friend Activity to turn it off. Do you watch the Stranger Things show on Netflix? Find out how to use a Stranger Things mode in Spotify on your iPhone app and add a fun display option for listening to music affiliated with that show.